This modern chic three bedroom home is located in the quiet Arrowhead and Peoria 83 Neighborhood. (Veteran owned). The location allows for close access to the freeway(less than 0.75 mi from 101 freeway and popular venues, like the baseball stadium, while providing guests with the security of a quaint neighborhood. Making our home a perfect choice for families or groups wanting to enjoy the comforts of home with the amenities of a hotel. This spacious vacation retreat features an open floor plan and is designed to accommodate families and groups. 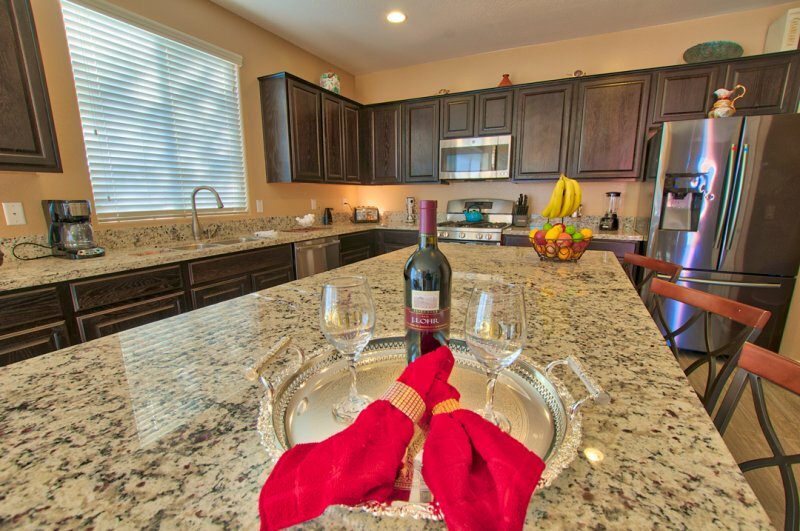 The home provides guest with all the modern amenities with the comforts of home. House is a recently built, about five years old, a peaceful street, high ceilings, custom paint, matching custom faux wood blinds and many other upgrades throughout. 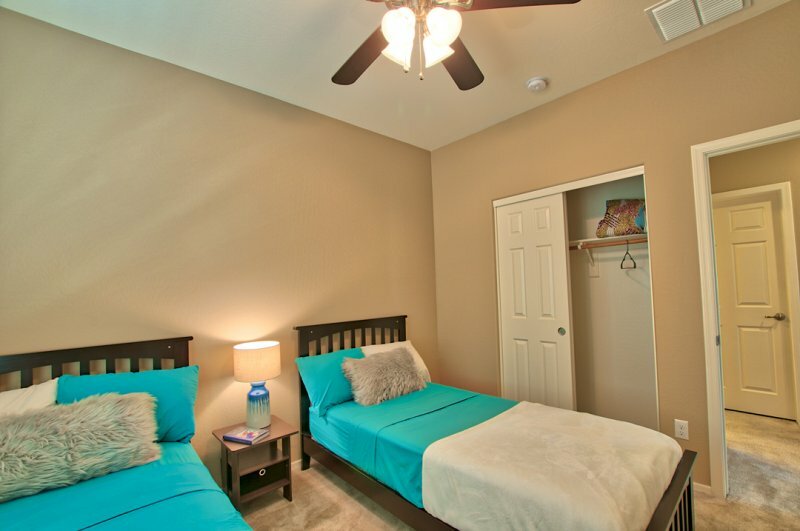 Dual-zone split central AC, additional storage all over the house (coat, linen walk-in closets…). 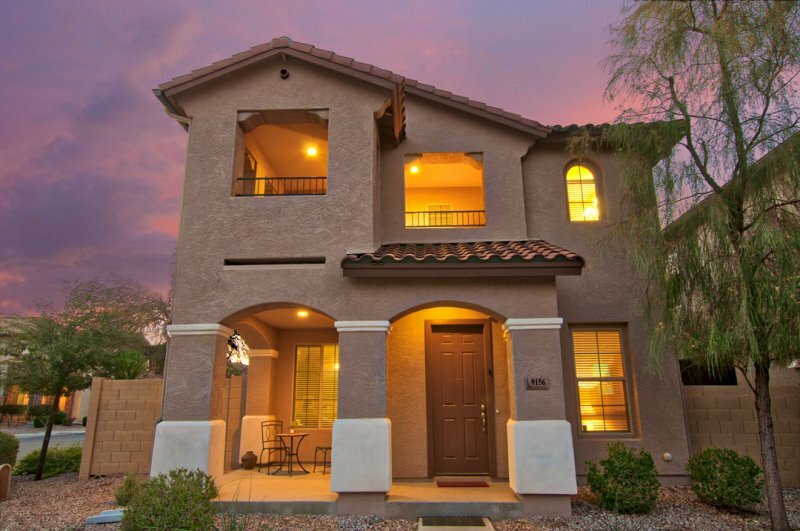 Your vacation home is about 14 minutes from University of Phoenix/Arizona Cardinals Stadium via the Loop 101 highway. Moreover, Peoria 83 District and Baseball Stadium is 5mi & Suprise spring training is 8mi. For peace of mind, two car garage to park your valuable vehicles and additional parking in guest parking in addition to the accessible parking area. The beds include 4 single Twin Extra Long, 3 of them are Tempurpedic comfy beds for a good night rest, of course, a California King bed in your master Bedroom for you and your forever Love, a sofa bed in loft area and 2 large couches in Living room downstairs for Movie Night, and a Captain chair just to name a few. Three HDTV 55" 4k TVs, 1 in the master bedroom, 1 in the loft area and 1 in the living room. As part of the open floor plan, the living room provides guest with ample seating and open access to the kitchen and dining spaces. The master bedroom’s loft-style design gives privacy, while still keeping the space connected to the rest of the home. Wake up in the morning to sit on the private balcony with a cup of coffee or relax in the evening with a glass of wine. The additional bedrooms are spacious and are furnished with top of the line mattresses and furnishings. Guaranteeing that guest receives a full night’s sleep. The home has 2.5 bathrooms. All of which are stocked with all needed amenities, including linens and toiletries. The kitchen is the heart of the home. That in mind the kitchen is fully equipped with the most up to date appliances and cookware to allow guests to prepare their favorite home-cooked meals with ease. As an additional amenity, the home has a full sized laundry room area. Allowing guests to wash and dry clothing as needed. As part of the experience, guests have full access to the outdoor living space. Complete with BBQ and comfortable outdoor furnishings. and playground. Dog-friendly community with Dogs waste stations throughout. The home is perfectly located to allow guests easy access to entertainment, restaurants, shopping and more. •Grocery Stores: The house is located within miles of Albertsons, Trader Joes, and Costco. •Skunk Creek Trail: If getting out in nature is what you want Skunk Creek trail is perfect. It is a 3.5-mile path with gentle hills allowing for all skill levels. •Thunderbird Conversation Park: The park is dog-friendly and consists of various desert trails offering wonderful views and glimpses of local wildlife. •P83: Known as the entertainment district. P83 houses the Sports Complex, Arizona Broadway Theater, various restaurants, and shops. You could easily spend a day walking tasting the local cuisine. •Museums/Art Centers: The Peoria area has countless museums and art centers. -Caterpillar Visitor Center: Discover the humble beginnings of the company along with the progress made over the years. -Peoria Playhouse and Children’s Museum: The museum provides children with the opportunity to explore and experience all different aspects of the world around them. •Peoria Zoo: The Peoria Zoo is home to over 100 species of animals from around the world. The zoo also hosts special events throughout the year, including an Easter Egg Hunt. Description This modern chic three bedroom home is located in the quiet Arrowhead and Peoria 83 Neighborhood. (Veteran owned). The location allows for close access to the freeway(less than 0.75 mi from 101 freeway and popular venues, like the baseball stadium, while providing guests with the security of a quaint neighborhood. Making our home a perfect choice for families or groups wanting to enjoy the comforts of home with the amenities of a hotel. This spacious vacation retreat features an open floor plan and is designed to accommodate families and groups. The home provides guest with all the modern amenities with the comforts of home. House is a recently built, about five years old, a peaceful street, high ceilings, custom paint, matching custom faux wood blinds and many other upgrades throughout. 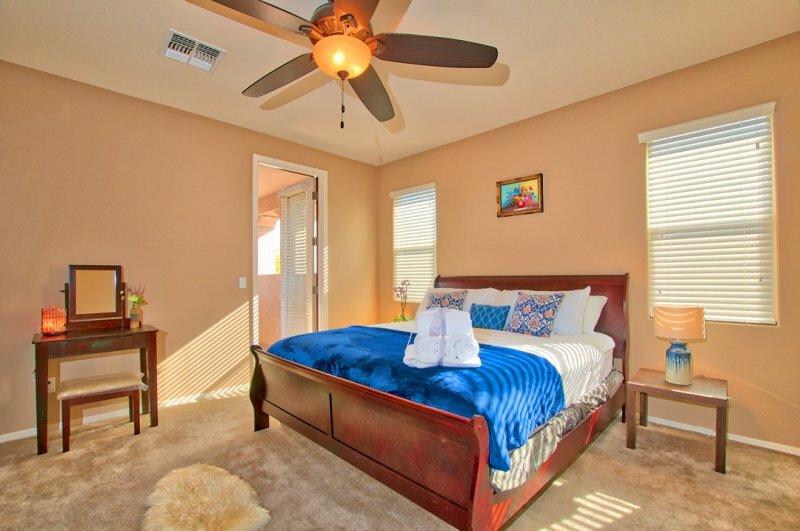 Dual-zone split central AC, additional storage all over the house (coat, linen walk-in closets…). 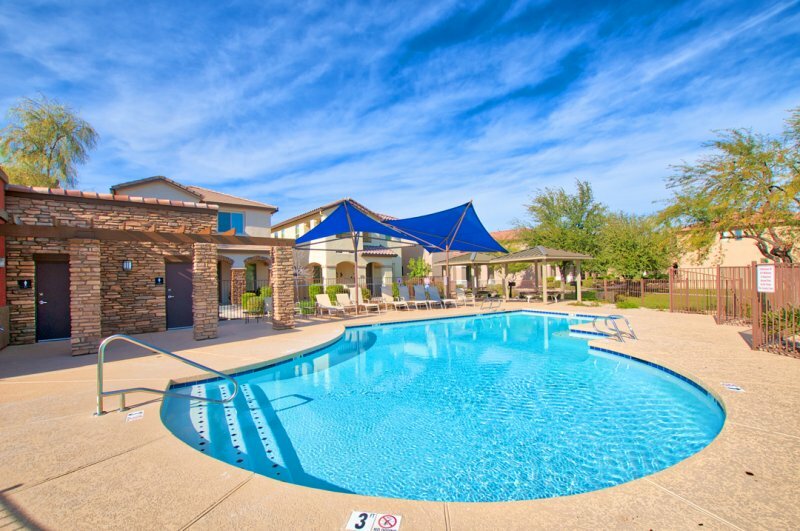 Your vacation home is about 14 minutes from University of Phoenix/Arizona Cardinals Stadium via the Loop 101 highway. Moreover, Peoria 83 District and Baseball Stadium is 5mi & Suprise spring training is 8mi. For peace of mind, two car garage to park your valuable vehicles and additional parking in guest parking in addition to the accessible parking area. The beds include 4 single Twin Extra Long, 3 of them are Tempurpedic comfy beds for a good night rest, of course, a California King bed in your master Bedroom for you and your forever Love, a sofa bed in loft area and 2 large couches in Living room downstairs for Movie Night, and a Captain chair just to name a few. Three HDTV 55" 4k TVs, 1 in the master bedroom, 1 in the loft area and 1 in the living room. Living Room: As part of the open floor plan, the living room provides guest with ample seating and open access to the kitchen and dining spaces. Master Bedroom: The master bedroom’s loft-style design gives privacy, while still keeping the space connected to the rest of the home. Wake up in the morning to sit on the private balcony with a cup of coffee or relax in the evening with a glass of wine. 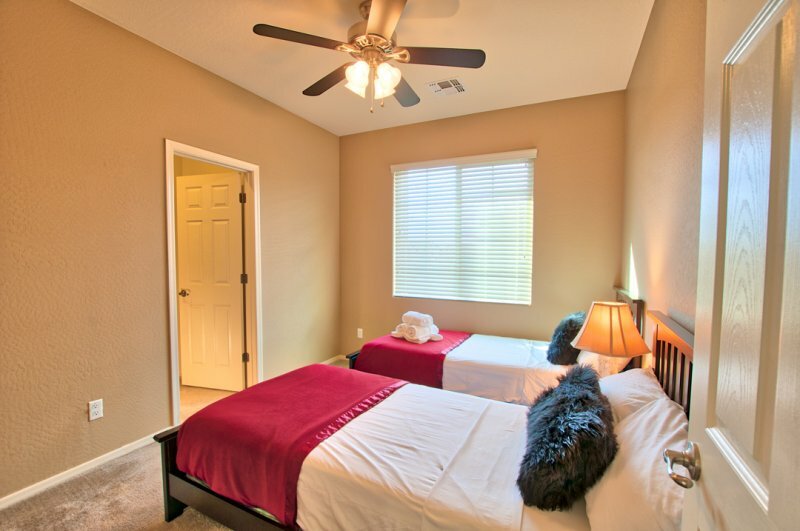 Bedrooms: The additional bedrooms are spacious and are furnished with top of the line mattresses and furnishings. Guaranteeing that guest receives a full night’s sleep. Bathrooms: The home has 2.5 bathrooms. All of which are stocked with all needed amenities, including linens and toiletries. Kitchen: The kitchen is the heart of the home. That in mind the kitchen is fully equipped with the most up to date appliances and cookware to allow guests to prepare their favorite home-cooked meals with ease. Laundry Room: As an additional amenity, the home has a full sized laundry room area. Allowing guests to wash and dry clothing as needed. Out Door Living: As part of the experience, guests have full access to the outdoor living space. Complete with BBQ and comfortable outdoor furnishings. Community Area Spaces: The home is located in a safe, quiet family neighborhood. As a guest, you will have access to the communities spaces, which include the pristinely kept pool next to the house and the door and playground. Dog-friendly community with Dogs waste stations throughout. We welcome all nationalities. The whole home is yours! You will be renting the entire 1900 sq foot as well as access to the community pool and parks not counting ALL the attractions and activities available within a couple to a few miles Please ask me about Military/Veterans discount. Parties are NOT allowed at this property. This is a quiet family community with a Home Owners Association. Indoor and outdoor activities are provided for your family or small group of friends to enjoy. Outside activities should end no later than 10 PM to respect the neighbors and community. I have no issue with guests having private parties, Just No noise after 10 PM as this a tranquil family Area The home is perfectly located to allow guests easy access to entertainment, restaurants, shopping and more. •Grocery Stores: The house is located within miles of Albertsons, Trader Joes, and Costco. •Skunk Creek Trail: If getting out in nature is what you want Skunk Creek trail is perfect. It is a 3.5-mile path with gentle hills allowing for all skill levels. •Thunderbird Conversation Park: The park is dog-friendly and consists of various desert trails offering wonderful views and glimpses of local wildlife. •P83: Known as the entertainment district. P83 houses the Sports Complex, Arizona Broadway Theater, various restaurants, and shops. You could easily spend a day walking tasting the local cuisine. •Museums/Art Centers: The Peoria area has countless museums and art centers. -Caterpillar Visitor Center: Discover the humble beginnings of the company along with the progress made over the years. -Peoria Playhouse and Children’s Museum: The museum provides children with the opportunity to explore and experience all different aspects of the world around them. •Peoria Zoo: The Peoria Zoo is home to over 100 species of animals from around the world. The zoo also hosts special events throughout the year, including an Easter Egg Hunt.